It has been around 3 weeks since I had this phone with myself and not to forget this gives me a longer period of time to test it out as my daily driver before writing up a review. This is probably the first phone from honor that I am reviewing. In terms of impression, for me its as simple as an affordable co-brand of Huawei. Honor have released plenty of breathtaking smartphones which made us wonder ” how come a smartphone with such capability can be this cheap?”. No doubt about it and its a fact that honor is definitely one of your best choice when it comes to affordability. What do you get inside the box? This is probably one of the most noticeable part of the phone itself. Therefore none of the honor C series has an aluminium back finish and well known for budget finishing concept. The honor 5C however changed the entire perception. People started to think what’s the price going to be like knowing few expensive features have been added to the phone. On the Silver version of honor 5C, there’s nothing unique on the front and there’s no physical capacitive buttons anymore as it have been replaced with on-screen buttons. On the back, you’ll find the gorgeous brushed aluminium back which feels very nice to hold. It adds an expensive touch to the phone giving an exquisite feeling. Not to forget the newly added fingerprint scanner placed below the main camera. On the bottom, there’s two speaker grills. The one on the left works as the “Active noise cancellation with dedicated mic” while the right is the actual speaker. Other than that, there’s the USB charging port which is the regular one without the implementation of Type-C. 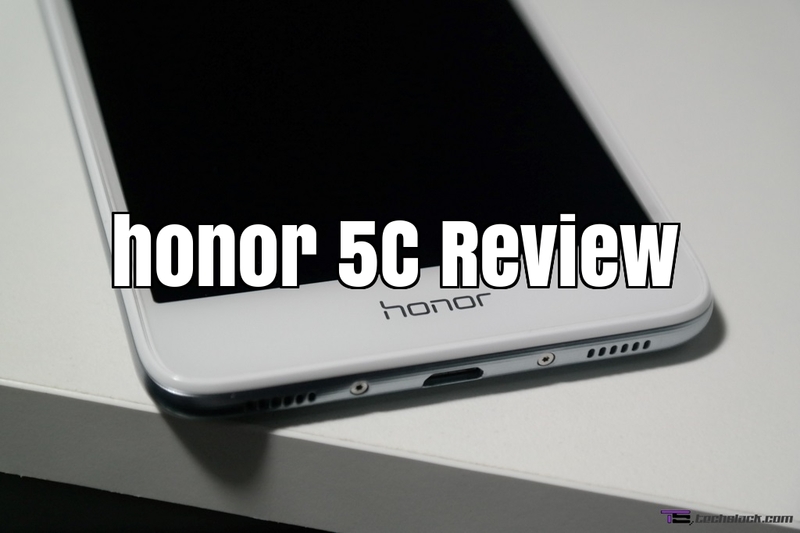 The honor 5C gets an upgrade to the display resolution as well. Having a 5.2-inch display with a Full HD resolution definitely adds up its value point. Its display is based on IPS and works flawlessly under direct sunlight. Its auto-brightness works perfectly adapting to the bright sunlight and enables you to use it comfortably without having to struggle in order to see the display clearly. The main selling point of the honor 5C will be its processor. It is powered by the Hi-Silicon Kirin 650 Octa core processor which has a flagship grade of 16nm. No doubt on the performance as this is a well proven processor which is known for its wonders. I had no problem using it for multitasking and light games. The honor 5C is probably one of the best 2GB RAM smartphone available out there that I have used so far. The flagship Kirin processor works flawlessly and definitely a wise choice to feature it in the honor 5C. However, I noticed some minor lags and slow-downs during the time where plenty of apps are running on the background. I have a personal opinion where honor could have placed a cheaper processor such as the Kirin 620 and paired it up with 3GB/4GB of RAM would be a wiser choice. I have seen smartphones with greater performance when the high availability of RAM kicks in place. Of course, the 16nm processor running on the honor 5C is intended to be a power saving processor which gives a huge impact on a better battery life. In terms of storage capacity, there’s 16GB of on-board storage together with micro SD card expansion slot up to 256GB using the SIM 2 slot. Knowing this as a Dual SIM smartphone, the SIM tray is a hybrid tray which works as two SIM cards OR 1 SIM card + 1 micro SD card. The Operating System itself takes about 4GB of the internal storage, leaving you to about 11+GB. If you’re a heavy user and hugely rely on saving videos, please get your micro SD card ready as the honor 5C does not support USB-OTG feature. This smartphone comes with dual SIM capability and support up to 4G LTE (Cat4) connectivity. The call quality was good most of the time being very reliable. Network was stable most of the time unless I get into underground parking areas and the usual problem starts no matter what phone I use. Other than that, the 4G LTE is super fast and works flawlessly on my Digi network. One point to take note will be its Dual SIM slot, the SIM 1 slot supports up to 4G LTE while the SIM 2 slot supports only up to 2G. Being a great fan of honor’s UI, I love their interface so much. It is very simple and fast without any flaws unless the work load on the background gets big. This is one of the smoothest UI I have used, specifically the Emui 4.1 based on Android 6.0 Marshmallow. There’s build in apps such as Health and Phone Manager which helps you in your daily routine. The Health app tracks your walking pattern, sets a target and will notify you on a daily basis if you’ve reached your goal. The Phone Manager app allows you to optimize your honor 5C to its optimum performance by clearing unnecessary running apps on the background or unwanted junk files from your smartphone. The fingerprint scanner on the honor 5C is one of the fastest I have seen so far. It is about almost as fast as the Vivo V3 Max that I have tested quite some time ago. Things you can do with your fingerprint scanner will be such as taking photo/video, answer calls, stop the alarm. These can be done by touching and holding the fingerprint scanner. Also, you can show the notification panel and browse photos by sliding your finger on the fingerprint scanner. Last but not least, the battery life on the honor 5C. It comes with a non-removable 3000mAh battery and based on my average usage pattern, it lasted around 1 day and 14 hours to be exact with 3.5 hours of Screen On Time. No doubt the battery life is pretty good despite having a Full HD resolution and a major thanks to the 16nm Kirin 650 processor. I am always honest when it comes to my reviews. My conclusion on the honor 5C is that you can buy if you want a reliable smartphone which could last you more than the 1-2 years of usage period. Of course some of you might argue that for the same price range, you can get something with higher specifications.It costs you RM799 inclusive of GST to get the Silver or Grey variant while RM849 for the Gold variant. But trust me, in terms of reliability, there’s not many brands out that could guarantee you. It’s up to you if get something and keep it for few months and change or buy and keep the phone until the End Of Life. 3GB of RAM could have make this phone as one of must have smartphone of 2016, however the honor 5C is one of its kind. As honor tagline always mention ” For the brave”, are you brave enough for the honor 5C. - Both SIM slots should have supported 4G LTE rather than one of it.